Please read what our customers think of us. So many people cannot be wrong. If you would like to share your testimonial please click here. Thanks in advance. Very, very cooperative and supportive in the process. The final products ( signage ) were excellent, very reasonable pricing, and most importantly the signs were ready for pickup within 48 hours of sign-off. I was very pleased with the service provided by Ian to create promotional Vanity license plates. Ian designed three excellent options from which to choose, and was very quick in creating the final product. I would highly recommend the TeeShirtery to anyone. If a person can envision what they want, (or if they can not), Ian can make it happen. A good listener putting terrific skills into action, producing durable signage within a professional time line. Ian is also accommodating when deadlines jump ahead of us. By locating his business in the rural community of Parrsboro, Ian has made many things possible. Ian has been great with the computer stuff (about which i admittedly know nothing) but I especially like the metal-backed signs he made for the office--they are durable, moveable, and they clean in a good rain! I have to say I have used Tshirtery for a couple of years now. I get all my tshirts printed by them. Then sent to me and I then pass onto my customer. I'm very happy with everything from the service speed to the quality. It all ads up to keeping me returning tiem and time again. It's how this company works with my company that helps keep me in business and keeps my customers coming back to me which in turn keeps me coming back to tshirtery. Ian is great to work with... always helpful, creative, offers good suggestions to make the project better. The cards advertising our little "hobby" shop were done with the utmost of professionalism. They were designed by Ian and more than pleased with his expertise in the final outcome. Those dropping in do not leave without one! His workmanship shows in the signs throughout our town and beyond with precise detail and fast service no matter what you are looking for. We would not hesitate to recommend him for his work - no job is too small for Ian! Thankful we have this service in our area....proud of it...you bet. 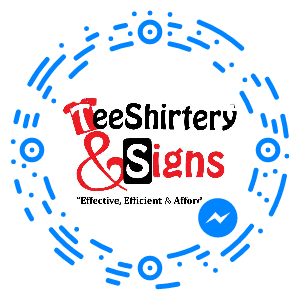 "If you're looking to get a new business card or a new t-shirt, check out the TeeShirtery in Parrsboro. Owner Ian Black really knows how to get the job done. He provides super-fast and friendly service and his designs are top notch. From now on, he's my go-to guy for this kind of work"
Great local place to shop. Turn around quick service. If you need something, just ask, he will no doubt have it, or can get it. Great community shop as well. Always thinking up new ways of doing things and things to do. Love going into this shop and taking company there. Great job, he has done work for me and it has been outstanding! Highly recommend it!! I am truly grateful for the hard work that was performed on my lap top computer today. I am so happy because this tool was my communication tool and my lines were interrupted with my family and friends in Ontario. Ian's work performance is more than excellent. Thank you so much for this service and I would highly recommend your Services to anyone that needs computer work. Also his business practices are personable. Best place ever to have signs done. i can't believe how fast they get things done. you did an amazing job on our signs for Dad's Country Market. Thanks so much. Excellent customer service, which is a hard thing to find these days! All orders our Fire Department have placed have been completed days before we expected. Thanks for your hard work!